In the 1960’s a new chic in lighting arrangements was about to hit the shops. It wasn’t the second coming of the Antique crystal chandeliers, although they can be a lovely addition to the home as you can see at http://roccoborghese.com/crystal-chandeliers/borghesina-classica/ , this was when the cool, hip and groovy appeared lava lamp. No one could be cool without a Lava Lamp. In fact, if you don’t see one somewhere in a film from the nineteen sixties of seventies then it’s not authentic. Anything made after that about the period has to have one in by law. Ok, that’s not true but if ever a piece of decorative lighting could define an era it would be these lights. Edward Craven Walker was the inventor and before you think he was some funky art student drop out he was in fact an accountant. So, let that be a lesson to you, accountants can have groovy ideas to. Walker set up the company Mathmos to sell his new product hoping that it would offset the rather austere look of the start of the sixties and get Britain into a more futuristic look as the country was still suffering from rationing and the devastation of the second world war. It certainly got the whole psychedelic vibe that was starting, and it seemed to fit perfectly in with what the people taking LSD were actually experiencing at the time. How does it work? It basically has a basis in science called the “Rayleigh-Taylor instability” is illustrates how the whole thing runs on a principal of fluid mechanics. To give you a cut down version a twenty-five to forty watt bulb is set in the base. When you turn it on it starts to heat the specially formulated wax and fluid(don’t ask it’s a trade secret but I would imagine some active polymer is added to it to gage elasticity under heat. You ‘ll have to look that up yourself because whilst I know what I’ve written in my head I’m not sure I could give you the a scientific break down). The wax floats to the top and then cools away from the bulb and sinks back down again. When it gets going it’s quite hypnotic. The wax forms bulbs and columns only for it cool down and lose buoyancy and float back down again. The technique has been used in several high-profile films and TV shows during the 1960’s. One, the notorious Barbarella, even borrows the name Mathmos making it Matmos a rather nasty intelligent sludge that lived under the city of Sogo and feeds of the negative energy of the inhabitants. Here she is meeting it. Bummer man! The other is the launch sequence for Rover in The Prisoner. This was a big balloon that basically suffocated and absorbed anyone trying to escape from The Village. The designs of the lamps have changed very little and you can easily get a piece of 60’s chic that still looks amazing today. 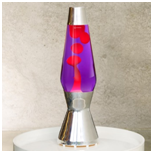 Be the first to comment on "Lava lamps are so cool man"